Every now and then comes a pedal like the BOSS MO-2 and changes the way you play guitar. 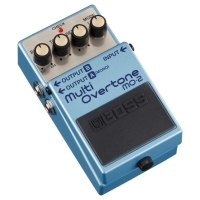 The Boss MO-2 Multi Overtone is a pedal effect that adds overtones to your playing. That changes your original tone to an enriched, wide and expressive organ-like one. Thanks to its integrated Multi-Dimensional Processing and the custom DSP, The MO-2 brings your sound to another level with harmonically saturated sounds. Not only that, thanks to a stereo output you can connect the BOSS MO-2 Multi Overtone to two amplifiers and create a wide stereo sound. We think this one will become a legend.